This is the three-wheeled electric roadster that covers up to 100 miles from a full charge of a standard AC power outlet. 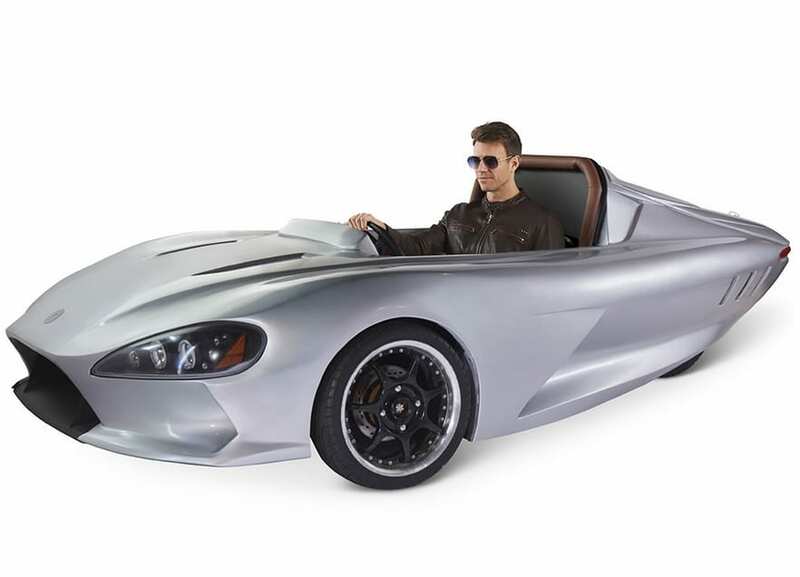 The roadster’s streamlined fiberglass chassis imparts a low-profile aerodynamic race car-like sleekness that facilitates its 7-second 0-60 mph performance. Its 156-volt electric motor generates 33 horsepower for its carbon kevlar chain that turns its single rear drive wheel in near silence, resulting in a top speed of 75 mph. Pushrod double wishbone suspension provides a smooth ride and regenerative brakes provide smooth stops. Its open cockpit accommodates two persons in quilted leather seats and protects them with an integrated rollbar and three-point harness seatbelts. Battery charges in three hours.